With the aim of becoming the leading manufacturer worldwide of machines for automatic insertion of electronic components, the company will undertake actions in three areas: the development of a new, high-performance machine, the opening of a new factory in China and an increased production capacity in their plant in Bergara. Ander Aramburu, Lazpiur’s CEO, explains that this goal is ambitious, but realistic. “There are ten companies in the world that manufacture machines of this type, but only six of them are really significant. We are in third place. The companies ahead of us are German and Korean”. Aramburu assures us that the new machine that Lazpiur will present in November in the Productronica Fair, in Munich, “will be revolutionary, because it includes in a single unit many of the technologies used by the players in this sector. Also, it will be smaller and quieter, which are characteristics that our clients demand”. This machine will be manufactured both in Bergara and in China, their first factory abroad. Aramburu explains that the move into China is part of a natural progression. “China represents 15% of our exports, only Germany, Morocco and Mexico take more. At the same time, it is much bigger and has the most rapid growth, so we had to go there, because it would be impossible to supply that market from Bergara. It would not have been reasonable to miss this opportunity, especially when the firms that we supply are investing heavily”. 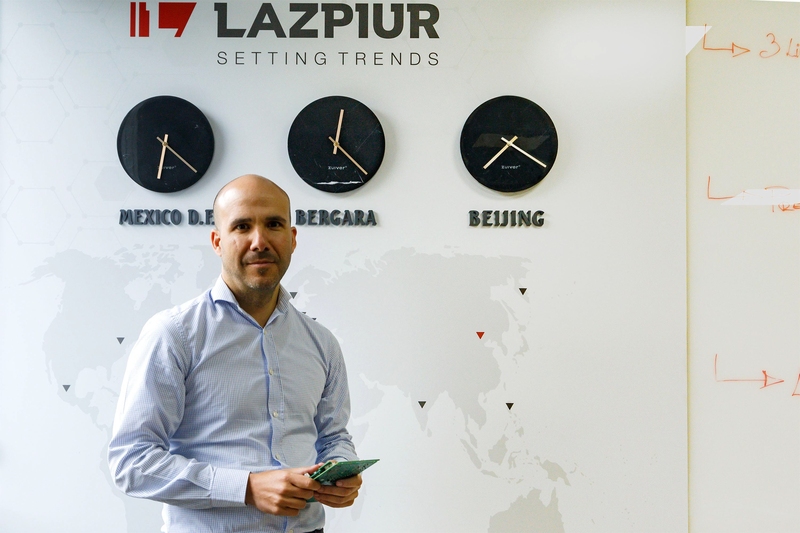 At present, Lazpiur’s sales in China are 3 million Euros per year. The plant in Tianjin, which will have a workforce of 20 people, will produce 60 machines a year, for a turnover of 20 million in 2022. 5 million Euros will be invested in setting up the premises in Tianjin. Nevertheless, the headquarters will continue to be in Bergara. According to the CEO, “if we didn’t go there, we would probably lose business here. Not only that, this market opens the way to complex projects that we will have to manage from Bergara”. In fact, the expansion of the Bergara factory is the third factor intended to make them the leaders. The works to expand and remodel one of the factory buildings, covering 3,000 square metres, will start in September and involve an investment of 7 million Euros, including the purchase of the most modern equipment. The plan contemplates the digitization of the company and its international expansion, since it exports 70% of its products. In fact, the opening of the Chinese factory may be followed by others. “If this goes well”, explains Aramburu, “we would consider setting up in South America”. The plan also includes, as a prime objective, making Lazpiur an attractive company. “There are companies in Guipuzcoa that have managed to create a good reputation, so that working in them gives you prestige. Perhaps we have not paid enough attention to this aspect, when really, it is crucial. Attracting talent is difficult, and the first step is to make yourself known. We have to become a referent for young people who are finishing their professional training or engineering studies.